I know packing lunches can be super boring, whether you're packing for a child or for yourself. It's so hard to come up with new lunch ideas, and packing a lunch every day can be so redundant! Well, The Jersey Momma is here to help! You might've read my first post entitled 9 Exciting Snacks to Liven Up Your Lunch Box, or the follow-up 5 Better For You Lunch Box Snack Ideas. Now I'm back with some more fun finds from the Fancy Food Show! No time to read? Want to save this post for future reference? Pin the photo below and you're good to go! And just for the record, this is not a sponsored post. I might have received free samples or tasted free samples at The Fancy Food Show, but this did not influence my opinion and I was not otherwise compensated for this post. Kudos to Awsum Snacks for creating a treat that is non-GMO, filled with natural ingredients, and original in flavor and style. They're sort of a cross between cereal and a crunchy snack. They are light and airy like cereal, with a substantial crunch and sweet taste. They come in flavors like strawberry, fruit, cocoa, vanilla, and standard corn puff (but you can also find them in cheese and sea salt). They are a unique product and flavor, definitely something different for the lunch box! All of the ingredients are natural (even the coloring comes from natural sources) and they are soy free. Find them with my Amazon affiliate link or use their store locator to find a retailer near you. I am always recommending Bakerly snacks to people, and you can even find them in several of my posts about snacks and The Fancy Food Show (a few years ago, I even held a Bakerly giveaway! Check that out here). I just seem to love everything they make. Their hazelnut crunchy crepes are seriously addictive. Each one comes individually packaged, and they're made with all natural ingredients. Find them through my Amazon affiliate link or look for them at your local retailer. I loved these simple little turtle shell 'snack scoopers.' They're great for dips or just to eat plain, and I loved the unique shape and the crunchy pop when eating them. They taste a little bit like a popcorn rice cake. There's only one problem- I have NO idea where to find them! I wasn't even able to locate them online. I am posting here in hopes that someone knows where to find or purchase them, because not only were they delicious, but kinda cute, too. I know, I know, you might be turning up your nose at this one, but Valley Shepherd Creamery is a local creamery in Long Valley, New Jersey (you can read more about them in my blog post here), and they were very excited to tell me about their sheep's milk yogurt at the Fancy Food Show this year. If you are a sheep's milk fan then you must try this- light, delicious and as fresh as you can get! This is made with milk from Valley Shepherd's own sheep. Find it at local farm markets or buy directly from Valley Shepherd Creamery (they have an awesome store, and tours, too!). We found these soft pretzel bites from Pretzilla at our local Costco and they quickly became one of our favorite snacks. Eat them warm or at room temperature, they're yummy either way! They also come with salt that you can add to them, but I swear they didn't even need it. Maybe you think kettle chips are a dime a dozen, but One Potato Two Potato are awesome! Non-GMO, they even come in different flavors, like sweet n' salty and sour cream and onion. I love their new bags with Mr. Potato Head on the front, too! You can find them at most local retailers, and in snack sized bags, too. They are also available for purchase at the One Potato Two Potato online shop. Okay, you might not want to put this in your kid's lunch box, but a snack for yourself, yes! The perfect mix of salty, sweet and hot (but not too hot), these hot and sweet nuts from Little Bird Kitchen are delish. I like to snack on them at night while watching my Netflix faves. 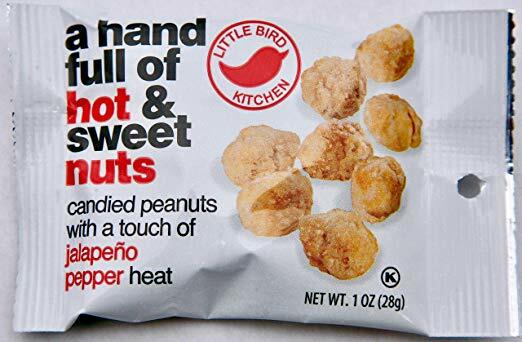 Find them on Amazon through my affiliate link here or use the store locator on their site to find them at a retailer near you (I have spotted them locally in New Jersey at Lolli and Pops stores). If you're looking for more fun snacks to try, check out my Amazon affiliate links below! Easy Autumn Leaf Pressing: No Ironing Required!